Property Rights and the US constitution in one blockbuster forum August 02! Property rights and Liberty are two of the legs of the three comprehensive rights we are granted by our creator. There are few folks who understand the scope and loss of property rights under agenda 21 as does Tom DeWeese. Likewise the study of the United States Constitution has become an unmatched professional pursuit by KrisAnne Hall. Both are experts in their field and highly respected throughout our nation, giving speeches, offering seminars, and teaching effective resistance and methods of restoring our natural rights. 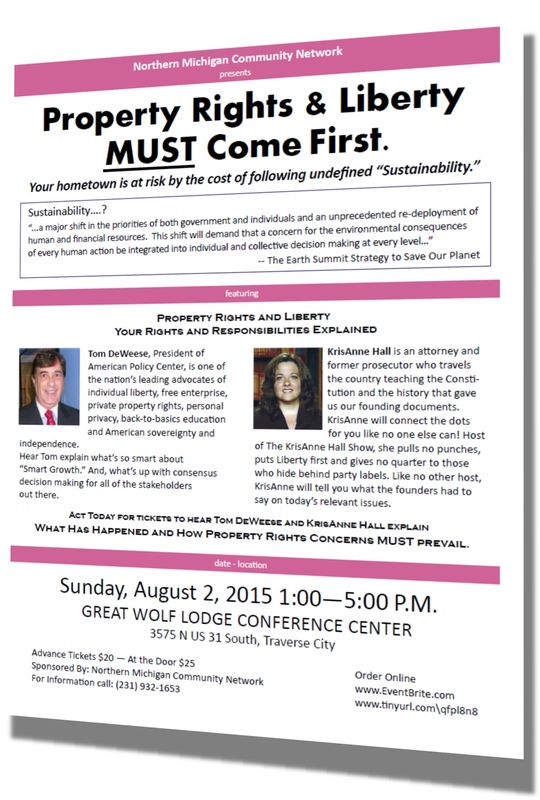 Join us Sunday August 02, 2015 at the Great Wolf Lodge conference center in Traverse City Michigan at 1:00 PM. You can order tickets by sending a message through the ‘submit a tip‘ link above, OR print out tickets online at eventbrite. This is a cannot miss event! ← Let Them Buy Their OWN Damned Insurance. Given that said date is smack in the middle of the GOTV "push" weekend for the Kentwood Municipal Primary Election, I don't expect that I'll be attending. But I would love to see one of those seminars down in this neck of the woods.